Rowan Harper is nothing but a smart-mouthed bookstore clerk with a crappy love life on the night she walks into Rosie's Bar. Most of the drama in her life is borrowed from her best friend's adventures. But when she meets Gabriel--tall and movie star gorgeous--everything changes. Never mind that she turns down the drink he offers, or that he brims with secrets she can't begin to guess at. He ignites a desire in her she never suspected--and shows a fascination with her she can't explain. He has no family, no job, no bank account;he knows where she lives and her favorite flower. An aura of mystery cloaks him, even as Rowan grasps for facts, even as she fears an answer that could destroy her happiness. Gabriel can guide her through a wonderland of new sensations. But only if Rowan trusts him enough to follow. . . I took to the character of Rowan right away even if I didn't agree with all her choices. She is a bit awkward and doesn't have it all together the way her best friend, Laycee, does, but, in her own way, she's a strong woman. She speaks her mind as she sees fit. Rowan hasn't had the luck with men that her best friend has had either, and so she has some self-esteem issues when it comes to men. She can't quite believe someone like Gabriel would be interested in her. I really liked the early interactions between Rowan and Gabriel. He comes off as one of those perfect men--good looks, humble and yet strong, caring, and wanting to cater to Rowan. He has his secrets though, and while I appreciated that Rowan didn't press him in the beginning, I found myself getting annoyed with her the more involved she and Gabriel became for not asking questions. It went to show just how desperate Rowan was to hold onto Gabriel. I wanted to reach into the book and shake her. So, maybe that wasn't the part where she was at her strongest. Still, she did prove to be strong in other ways, and I have to give her credit for that. Of course, I knew what Gabriel was from the beginning even if Rowan did not. And as perfect as he is, I still found myself enamored by him. The attraction between Rowan and Gabriel was clear from the very first moment and, as the novel went on, it was clear the two were perfectly matched. As a book lover, I wouldn't have minded spending more time in the bookstore where Rowan worked, but, well, the book isn't about the bookstore. Or books for that matter. Although, I did have to wonder at times how someone so well read, including having read many vampire books, didn't instantly think "Vampire!" given some of Gabriel's behaviors and actions. Then again, in a world where most people do not believe vampires are real, I suppose I shouldn't be so hard on her. I mean, our brains automatically want to rationalize what we see and hear and put it in a context that fits our reality. I thought the theory Rowan came up with was great, although I questioned her judgement in staying with someone she thought was up to no good. 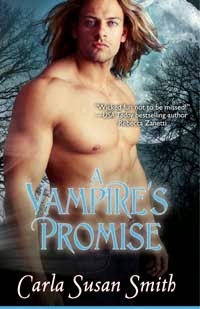 I had such fun reading this novel and trying to figure out just what a vampire's Promise is. It's clear that Rowan is special to Gabriel for a reason, and I found myself floating many theories as I read. Some came true, just maybe not for the reasons I expected. The vampires in Carla Susan Smith's world are definitely more on the side of the angels--well, some of them, anyway--than they are like the ones you might run into Bram Stoker's Dracula. But that's okay. It is a paranormal romance, after all. Warning: If you do decide to give A Vampire's Promise try, plan to read A Vampire's Soul as well. The first book doesn't bring you much in the way of resolution. The two books read as Part One and Part Two. There are some people who will tell you that if you fall in a dream it's a bad thing. ~ Opening of Vampire's Soul. Rowan Harper’s world has been wrenched apart. The man she thought she loved—the man she does love—is a vampire, and not the kind that glitters. Running away isn’t an option. Gabriel isn’t just her lover. She’s bound to him in ways she can’t comprehend, ways that put both of them in desperate danger even as Rowan’s desire for him blazes anew. I would not recommend anyone start with this book without first reading A Vampire's Promise. A Vampire's Soul picks up where the first book ends. Rowan has just discovered that not only are vampires real, but that her boyfriend, Gabriel, is a vampire. Rowan's reaction when she does discover this is how I imagine a real person might react--complete panic and utter fear. It was an aspect of the book I really appreciated. The author did a good job of bringing out Rowan's emotional turmoil. I could feel her fear, frustration and confusion. I could understand her anger and also her feelings of uncertainty. In A Vampire's Soul, Rowan is soon to learn exactly what a vampire's Promise is and how it impacts her. Despite her new found knowledge that her boyfriend is a vampire, Rowan realizes she loves Gabriel with all her heart. He will do anything to protect her, but is she willing to risk everything for him, even if it means she might lose her life? It's a question she has to ask herself the more she learns about Gabriel's past and a promise made long ago. In the midst of trying to remember a moment in her past she has locked deep away as well as figure out a way for her and Gabriel to have a life together, Rowan must also contend with a jealous vampire hell bent on getting her revenge. It places those closest to Rowan in jeopardy as well. This is where Rowan really shows her strength as a person, I think. She's the kind of person who would not think twice about giving someone the shirt off her back if he or she needed it. The reader gets a better understanding of Gabriel and his past in this novel. I had my doubts at first, but the the author pulls it off well, I think. It does make me want to know more about him. I was completely pulled into Gabriel and Rowan's story, both in this and the first book, A Vampire's Promise. The revelations in A Vampire's Soul brought some satisfaction, but also more questions. I am guessing the author will continue to write more books set in the world she's created with A Vampire's Promise and A Vampire's Soul. Or at least I hope so. You can learn more about Carla Susan Smith and her books on the author's website. Source: I received e-copies of both books for review from the publisher via NetGalley. These sound like fun, but boy, do I wish they had chosen better covers! Jenclair - I am not a fan of the covers either. I considered not posting them, but decided I would for consistency sake. Someone might be drawn to them. Glad you've enjoyed these books. It's always a treat to get onto books you really like. Pooch - Yes, it is! I am a big fan of urban fantasy, but the paranormal romance books that focus so heavily on romance are hit and miss with me. Glad you enjoyed this one! The concept looks fun but I'm always afraid it will go to the hokey side - especially with that cover! I've had bad luck with bookstore books so I'm glad this worked out for you even if there wasn't quite enough bookstore time! Katherine - Rowan working at a bookstore was such a minor part of the story, that she could have worked anywhere. I've not read a paranormal romance for a long while and these sound interesting. I'm glad you enjoyed reading them, Wendy! A Vampire's Promise sounds good. I enjoy paranormal romance from time to time and I like books that have books in them. A Vampire's Soul sounds good as well. I feel like we both finished reading similar books recently. Paranormal romance with vampires and endings that leave room for the next book. Not sure this is a read for me but I do like the sound of Rowan as she sounds like the kind of strong, feisty female character I appreciate. Tracy - Yeah, these are books best suited for those who like the genre, I think. Vampires aren't to everyone's taste (no pun intended). "Although, I did have to wonder at times how someone so well read, including having read many vampire books, didn't instantly think "Vampire!" given some of Gabriel's behaviors and actions. Then again, in a world where most people do not believe vampires are real, I suppose I shouldn't be so hard on her. " A.M.B. - I'm right there with you on the covers. I don't like them either. I think I would react in much the same way Rowan did if I discovered vampires were real.